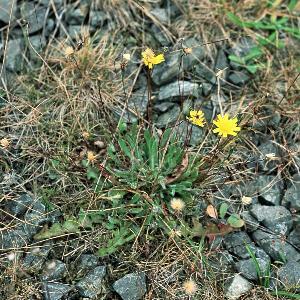 One of the commonest native yellow-flowered composites of dry grassy situations, with branched scapes (= flowering stems) bearing dandelion-like flowers about an inch or more across, the scapes swollen below each flower head. Leaves are all in a rosette, very bristly and wavy-edged. The whole plant can grow up to about 12 inches in height. 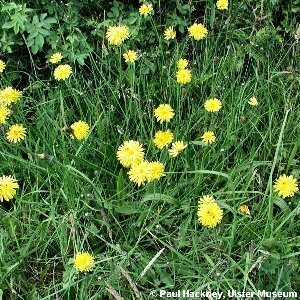 The only other common yellow-flowered composite with which this could be confused is autumnal hawkbit (Leontodon autumnalis) which is distinguished by its nearly hairless (not bristly), shiny and more deeply lobed leaves. Dandelions (Taraxacum spp.) differ from both of these species by having unbranched scapes. All names: Hypochaeris radicata L.; Hypochoeris radicata L.